derring-do, and tugging on the heartstrings!" From RITA® Finalist and USA Today Bestselling Author Margaret Locke comes The Legendary Duke, Book 2 of the Put Up Your Dukes Regency historical romance series. A tragic event in his youth led Gavin Knight's mother to whisk him to Rome, where he lived a simple but secluded life—until, on her deathbed, she revealed who he truly was: the Duke of Cortleon. Now twenty-nine, Gavin has returned to England, determined to learn what happened all those years ago. Despite charming his fellow lords and ladies alike, the new Duke disregards any notion of nuptials, as his honor first demands resolution--and retribution. Then he meets Lady Elinor Greene. For seven years, renowned beauty Elinor has refused all proposals, fearing marriage would curb her freedom. But when her family falls on hard times, Nelle must sacrifice herself to save them by marrying a man of means. A wealthy widower seems the logical choice, a passionless union perfect. Until she meets the Duke of Cortleon, and learns one Knight can be legendary. For Arthurian legend fans, The Legendary Duke is loosely based on the tale of Gawain and the Green Knight, and Arthurian Easter eggs pop up throughout! Brilliant! This have to be one of the best books I have read all year! 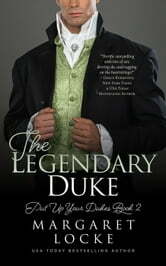 The Legendary Duke by Margaret Locke is book 2 in the Put Up Your Dukes series. As some of you might not know Margaret was up for a RITA this year for Demon Duke book one in this series and I can imagine this book will also be up for a RITA. It would be so deserved. If you are a regency lover as I am you MUST read this book. It is one of those book you can wait to see how it will end and sad when it does end. I can’t wait to read the next in this series. Margaret has created such wonderful characters, Nelle and Gavin, you cannot help but fall in love with both. The descriptions are so vivid you feel and see everything in your mind. Though in a series, Legendary Duke can be read as a standalone but I highly recommend you read Demon Duke to get the real feel of the story and the Dukes. This book is a real page turner and has scandal, duty, honor, revenge, murder, nightmares, memory loss, true friends, evil, madness, kindness, giving, orphans, coldness, masks, house parties, betrothed, death, grief and so much more. I highly recommend you read this book, you won’t be disappointed!! The Legendary Duke by Margaret Locke was brilliant! This is one of the best books I have read the last year! It also is the first book of Locke I have read. The story is not only about the two main characters, but also about 'the Duke' Gavin who was a lonely guy because he lived for 20 years in Rome and now came back to London and Sociaty. There he met some other Dukes and he learns what true friendship means. Lady Elinor, Nelle, has an reputation as a Ice Queen, but is also the one to save her family of a kind of bankruptcy and so ensure the marriage of her sister Lucy-Anne with the love of her life. But this is really one of those books you can't wait to see how it will end and sad when it does end. As a young boy, Gavin Knight fled with his mother to the continent, after he witnessed the murder of his father. Several years later upon his mother's death, he learns he is the Duke of Cortleon. Gavin returns to England, determined to find the murderer and avenge the death of his father. All he can remember is the man was a giant green man. Lady Elinor (Nelle) Greene, has no plans to marry and wishes to continue her work on behalf of the Foundlings Hospital. Due to straitened circumstances, Nelle's parents plan to wed her to a wealthy older gentleman. Nelle is opposed to this, but because of her love for her family, knows this may be the only option. There is obvious chemistry between Gavin and Nelle when they are together, but Gavin has no plans to marry until after his quest to find his father's murderer is successful. Their wonderful story and how they found their happily ever after is an emotionally gripping tale filled with intrigue, madness, revenge, honor, scandal, wit, and most of all, love. Moving romance with tragedy, loyalty, humor, and revenge. The story flows easily with compassion and warmth. I look forward to more from this author.